This thread is designed for things and everything to do with ground effects. I love the concept, however would a like a little history on it and some basic facts or cool things. I do know that Lotus back in the days did pioneer the idea and gained a lot of success out of it, not forgetting the Brabham BT46 also dubbed the "Fan Car" (one of my favourite designs of ground effects). I am aware that using ground effects at the moment is not too big in the formula as much aerodynamics. Any things regarding ground effects welcome. Check on youtube for "Secret Life of F1". I forget if it was in part 1 or part 2 but there's a pretty good explanation of ground effects. Its old, but the reasons given for why we don't see that technology anymore haven't changed. Thanks dude will check that out. This one is always coming up on YouTube, too. All F1 cars since at least 1980 have used the principle of “ground effect” in that they attempt to generate a zone of low pressure between the bottom of the car (today called the “floor”) and the track to generate down force. Nevertheless, the term is typically reserved for the cars raced from 1977 through 1982 that were characterized by having no restrictions on the shape of the floor and skirts that physically sealed the edges of the side pods to the track. This allowed the designers to create giant convergent/divergent shaped floors (called “tunnels” in the day) under each side pod and seal the low pressure generated against ambient air that would otherwise rush in to fill the void. Compared to their immediate predecessors that relied on crude wings, “ground effect” cars offered huge increases in down force and cornering speeds rose dramatically. The main and often overlooked advantage was the overall efficiency of the technique. A wing creates drag not only from surface friction but also as a result of making lift (called “induced drag”). The amount of induced drag increases the harder the wing has to work because it is a function of the amount of air that is displaced, moved and swirled into vortices by the wing. As with an aircraft, moving the wing into proximity with the ground reduces induced drag because the ground limits the amount of air the wing can influence. In 1982 the best cars were generating lift to drag ratios of 8:1, and that figure approaches the efficiency of some aircraft flying outside of ground effect. A car making the same amount of down force with conventional wings would be much slower due to the higher drag. The idea had its origins at BRM where designers Peter Wright and Tony Rudd experimented with inverted wing shapes applied to the side of the car. Those short, stubby wings also served as fuel tanks, but they were too high above the track and did not offer enough surface area to have any real impact of the car’s performance. When BRM closed shop both designers went to Lotus where Colin Chapman allowed Wright to continue his experiments at the Imperial College wind tunnel. Wright developed a model with much bigger wings covering the entire area between the tires. The area between the leading edge of the wing and the low point to the track provides convergence and accelerates air through the “gap.” The faster the air moving past a surface the lower the pressure it exerts on that surface. The rest of the wing shape behind the gap acts as a diffuser to gradually return the air to ambient conditions (the speed of the car). He discovered by experimentation that by physically sealing the sides of the side pods to the track, the amount of down force jumped up by thirty percent – “ground effect” was born. The keys to success were getting a good road seal with efficient skirts and properly shaping the floor so that the gap was not restrictive and the diffuser could support the mass flow without stalling. The first ground effect car was the Lotus 78 of 1977, and it was a working version of Wright’s wind tunnel model. It used a flexible rubber skirt that was fixed to the edges of the side pods and then tucked under the car. Suspension movement was accommodated by skirt bending. The follow-on Lotus 79 of 1978 took Andretti to the championship. It refined the process by cleaning up the aerodynamics and essentially extending the tunnel concept through the rear suspension. The T79 also introduced what became known as “sliding skirts” where the skirt was a rigid board that was mounted vertically in a channel at the edges of each side pod and able to slide up and down in that channel. Springs were used to push the rubbing surface against the track under all conditions. A larger suspension travel could be more reliably accommodated. The next two important cars were the Ligier JS 9/11 and the Williams FW07. Both Gerard Ducarouge and Patrick Head recognized the advantage of moving the center of pressure forward to reduce the reliance on the front wing, which interfered with airflow into the tunnels. In 1979 both of those cars had significantly smaller front wings than the competition, resulting in lower drag, and higher levels of down force because more air was moving through their tunnels. By the end of the era in 1982 many cars ran without any front wing at all. Before the ground effect era, a typical F1 car generated little more than one lateral G while cornering. Despite the tires of the day, G loadings increased dramatically – up to 3+ in higher speed corners. Today’s cars do even better, but the F1 driver of 1980 was not the athlete of today. Many struggled to cope and there were vocal critics. The tracks of the day were not equipped to handle the new speeds, and the aluminum monocoques used by most teams back then were not safe enough either. The FIA tried to limit performance by banning skirts for 1981. The rule was poorly drafted. It allowed a flexible rubber skirt no wider than 6cm that had to be rigidly fixed to the side of the car (like the Lotus 78) and ride no lower than 6cm above the track. Led by Gordon Murray at Brabham, the teams quickly came up with adjustable ride height suspensions that let the cars pass inspection in the pits but get the skirts onto the road surface when racing. The problem was that with only 6cm of flexible skirt to work with, the suspensions had to be rock hard. The Goodyear tire of the day was still a bias ply design, and it could expand over an inch at speed. This meant the drivers had to cope not only with the higher physical demands but also a bone jarring ride. Alan Jones retired over this. No one died as a direct result of ground effect, but there was a very real possibility of that happening, and it was really just a matter of time. If a skirt failed or lost its seal at the wrong time, the car would literally fly off the track. The cars were already going much too fast for the tracks of the day, and the speeds were going to get even faster as the turbos came along. The best turbo engines of 1982 made less than 600hp. That number would double in the next four years. 1982 had some close calls. Arnoux had a throttle cable stick and Patrese had an engine seize. Both times the car flew off the track at high speed into an abutment just a few feet away from spectators. The deaths of Villeneuve and Paletti and Pironi’s catastrophic injury also had people worried about safety, although none of those instances had anything to do with ground effect. The FIA acted to ban skirts outright and require flat bottomed cars in 1983. Those rules are still in effect today. Skirtless ground effect did continue on in other series, including CART and Group C, and many feel the FIA was a bit heavy handed in 1983. Today’s cars get a substantial amount of their down force from low pressure under the car. However, they rely on wings and other upper surface devices for most of their down force, which are subject to interference from turbulent air when following a car ahead. This adversely affects the racing, and artificially means like DRS now attempt to make up for it. In a ground effect car the down force was generated over a large surface area, which was less susceptible to turbulence, and there was a lot of great racing in those machines. Villeneuve/Arnoux’s 1979 French GP battle and Villeneuve/Pironi’s last race together in 1982 come to mind. One thing that is often forgotten about the wing cars is that turbo engines played a major role in their development post from 1979 on. Small and compact 1500 cc engines (V6 or L4) allowed a much better airflow below the rear of the car. In fact, it's perfectly possible that the earlier Renaults ("the yellow teapots") were quick (but unreliable) because their ultracompact engine allowed a much better flow. The turbo technology kept on improving and engines grew on power, but that not was necessary the case in 1979. This is also one of the reasons why Ferrari was one of the first team to shift to turbo engines, when their engine was largely the best in the late seventies. But a massive flat twelve was catastrophically bad in terms of air flow below the car. That is an interesting post, but I don’t see the connection between the development of turbo engines and ground effect aerodynamics. Almost all of the early turbo engines were derived from 2.0 liter normally aspirated Formula 2 engines that pre-dated the ground effect era. That was true of the Hart in line four and the Renault/Giordini V-6. The BMW turbo was derived from a stock engine block. 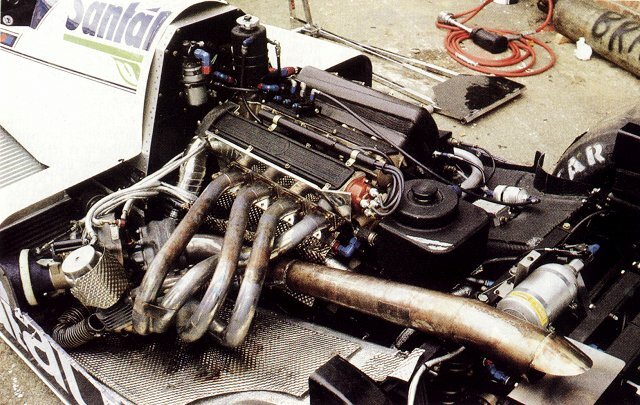 The all conquering Honda V6 turbo was also an F2 derivative and never raced in a ground effect chassis. None of them were particularly compact. The Hart and BMW turbos’ bottom ends were not strong enough to serve as a stressed member, and they had to be caged in a supporting truss that made them just as wide as a Cosworth. In the late ‘70s both Ferrari and Alfa Romeo had 3.0 liter flat-12s designed to keep the center of gravity low. Alfa just “bent” that engine into a V-12 to accommodate ground effect (Alfa 179 and 182 and Brabham BT48) and Ferrari could have easily done the same. Ferrari went the turbo route because it was the more powerful option and they had the resources to do it. Even so, the Ferrari 126C engine block was still just as wide as the Renault’s and the piston angle was kept as flat as possible at 120 degrees. In 1979 a typical Cosworth gave about 500 hp. The Ferrari and Alfa flat-12s were good for something like 520. The Renault/Giordini turbo could get up to 550 for qualifying if it held together. The turbos were a packaging nightmare in the ground effect era because the diffusers ate into space that was needed for the intercoolers. The amount of power that could be generated was directly related to the size and effectiveness of the intercoolers. In fact, the cars with the best ground effects (Williams FW07 and FW08, Brabham BT49, McLaren MP/4 1b) were not turbos. In 1982 Brabham stopped using the BT50 turbo for a while because the BT49D Cosworth was faster. They went back to the BT50 because of pressure from BMW and actually raced both cars at Canada (where Piquet won in the BT50 with Patrese dutifully coming second in the BT49D). Patrese also won with the BT49D at Monaco (under unusual circumstances). The thirsty and short lived Alfa V-8 turbo was designed after the ground effect era. In fact, the only ground effect optimized turbo engine I can think of was the TAG/Porsche that did not enter service before the end of that era. My point is that the turbo engines gave the cars a great advantage in terms of aerodynamics and I am not sure that, at the dawn of the turbo era, teams like Ferrari or Brabham would have shifted to turbo only for the engine. Of course, as the turbo engines grew in power and reliability, they became a must but this was not a given fact in 1979/80. You are correct to say that it was ground effects that allowed the DFV to continue winning against the more powerful 12 cylinder engines of the "grandee" teams - indeed that is why FOCA, led by Bernie Ecclestone, fiercely resisted the FIA's 1980 attempts to ban ground effects. However, you are wrong to claim that turbo engines played a major role in the development of ground effects in F1. I don't think your examples of Ferrari and Brabham help your argument. When Ferrari were trounced by DFV-powered ground effects cars in 1981 it was clear that the Flat 12 was redundant but it was equally clear that because of their greater power, the future belonged to turbo engines - there would have been no point in building a normally aspirated V8 or V12 to replace the flat 12. By the time Brabham switched to turbos in 1982, ground effects had been banned so the switch was definitely about superior power not aerodynamics. For anyone interested, the Gurneyflap site http://gurneyflap.com/ has great photos of many of the cars and engines from that era. Famous ground effect cars include Lotus 79 and 87, Brabham 49D, Williams FW07 and FW08, Alfa Romeo 182, Renault RE20 and RE30. The RE30 is featured in both ground effect 1982 RE30B spec and flat bottom RE30C spec that was raced in the first 2 races of 1983 before the RE40 was ready. The engine section includes the DFV, Ferrari 126C, Renault V6 turbo, Alfa V12, TAG V6, Honda V6 and BMW turbo. The ground effect era ended after the 1982 season, and the Brabham BT50 shown in the above post was raced in 1982 with full ground effects. It was actually one of the easiest to package because it had only one turbo and intercooler (shown) allowing the oil and water radiators to be alone in the right hand side pod. The V6s had to fit a turbo, intercooler and oil or water radiator in each side pod.